For an extra 50p you can also add a bottle of our mini hexagonal bubbles to the bag with the same personalised wrapper. Your names and date of wedding can be added to the front of all of the wrappers and there is room for a short message, eg: "Thank you for sharing our special day" to be printed on the back of the mini chocolates. Please type in the freetext boxes below the personalisation you would like on the chocolates and love hearts. 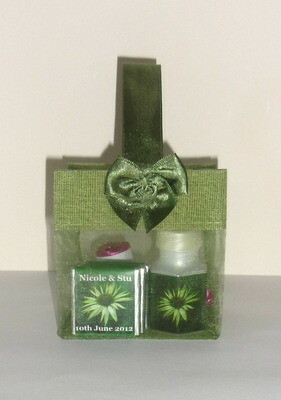 Please choose which colour co-ordinating green wedding design you would like on your chocs/love hearts. If you would like the gold bag but don't want one of the designs listed please e-mail me on info@itsawrapcornwall.co.uk and I can take the order by e-mail. NB: THIS GREEN TOTE BAG IS AVAILABLE TO BUY SEPARATELY AT 95p IF YOU WANT TO ADD YOUR OWN FAVOURS INSIDE: PLEASE SEE SEPARATE LISTING.